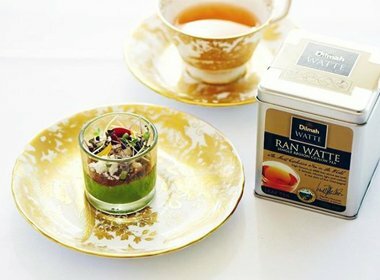 As the Dilmah Real High Tea challenge rolls around to each state in Australia we have five winners from three states to congratulate in June from Le Cordon Bleu. Le Cordon Bleu Adelaide students Gunawan Wu (Pâtisserie) & Wei (Bachelor Program) were awarded a Bronze medal in Adelaide's Dilmah Tea challenge, Son Sewoo won a silver medal in Perth with the highest score earning him top honours and Le Cordon Bleu Sydney Pâtisserie chefs Joseph and Angelo Roche won gold in Sydney! The Dilmah Real High Tea Challenge was inaugurated by the Fernando family in Colombo, in 2007, with the objective of 'putting the tea back in high tea'. 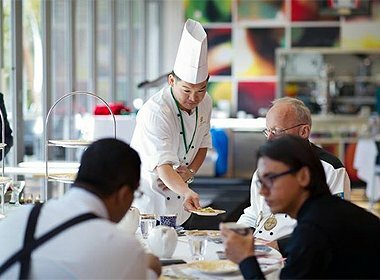 Both professionals and consumers have the chance to take part in the Challenge and The Professional Edition of the Dilmah Real High Tea Challenge is open to professional culinary teams to craft and prepare their own Real High Tea. The Dilmah Tea Aficionado Real High Tea Challenge is an invitation for tea enthusiasts to craft their own recipe in one or more of four given categories, where each recipe must include Dilmah tea in it. This is the third year that Dilmah has run the competition in Australia. Our Adelaide students Gunawan and Wei both highlighted their skills and training on the 5th of June by winning bronze, a fantastic result, considering they were up against professional chefs from across the country. The winning team was from the Hilton Adelaide, represented by Jon McKeigue and Sam Cairncross whose journey through Sri Lanka, Australia and into History with the Boston Tea Party, deservedly won Silver. No gold was awarded so to win bronze against this extremely experienced team with extensive pâtisserie skills is a huge achievement for our students who have only been studying pâtisserie for less than six months. Son Sewoo also competed in the competitive professional category scoring silver for his stylish Dilmah creation in the Perth heats. And finally pâtisserie chefs Joseph and Angelo Roche competed in the Sydney heats and impressed the judges with their complex sweet and savoury food and tea pairing to win gold. They are now eligible to win a trip to Sri Lanka when the overall nationwide winners are announced. Look forward to seeing a tea based item in the pâtisserie curriculum.